What a great weekend. I just wish that they could be longer. I often wonder, if we were able to go to a 4 day work week and a 3 day weekend, would that start to not be long enough too? I have a feeling that human nature would take over and suddenly, even though it was 50% longer than weekends used to be, it still wouldn't feel long enough. Saturday was a fun day spent with friends. We started with my son's soccer game and then met up with some friends for some roller skating. I really enjoy it. The rink is smaller than the one that I skated at as a kid, but the kids have a good time and I love 'active' activities. We also went to dinner, hung out and tried the new frozen yogurt place in town with our friends. The kids all had a good time hanging out. On Sunday, I finally felt completely 'normal' for most of the day. So, I took advantage and got a lot done at the house - folding and putting away laundry, doing dishes and emptying the dishwasher, putting away papers on the counter. It was nice to get those things done. If you didn't already know, now you do: February is Idaho Potato Lovers Month. I think it is wonderful that every thing seems to have it's own special day or month. Potatoes are one of those things that I don't think about a lot, but really seem to include in many of my meals. Perhaps it is my mid-western upbringing. Meat and potatoes seem to dominate many of the meals. There is some seasonality, to my typical potato usage, but others that seem to be more universal to all seasons. Mashed potatoes, for example, seem to be most associated with the winter months for me. They go so well with roast, pan fried pork chops, baked chicken and more. We have those meals sometimes, in the summer, but not as often. Parsley-ed potatoes seem to fall into a similar category. Hash browns (you can find my homemade hash browns recipe here) are more universal to all seasons, but usually associated with either breakfast food (even at dinner time) or sausage. We prefer to have our hash browns topped - cheese, tomatoes, onions and other toppings. One combination that you might consider is to add shredded cheese and bacon (or even easier, just add Hormel bacon toppings) to your hash browns to make it a meal on its own or as a side to your eggs or waffles. French Fries are certainly a multi-season treat. We like them with our chicken fingers and hamburgers off the grill. I have made french fries from potatoes, but most frequently, I purchase them already cut and ready to bake. Sometimes though, I like to enjoy a baked potato bar. Turn the potato into a meal! I like my baked potato topped with steamed broccoli, shredded cheese and bacon. Of course, I don't skip the butter, sour cream, salt and pepper...I just add to them. At work, they typically also have cheese sauce, scallions and other toppings to choose from. To make life simpler, when we make them at home, we usually keep it simple with broccoli, scallions, a bag of shredded cheese and Hormel bacon pieces or Hormel crumbled bacon bits on our potato bar. How do you top your potato? Of course, if you remove the potato pulp and fill the skins with cheese and bacon, they transform from a meal to an appetizer or party treat. I just wonder what you do with the potato when you make potato skins. Have you ever made homemade potato skins? What do you do with the potato? I was just studying my weekly ad and see that Idaho Potatoes and broccoli are on sale, maybe I should plan for a potato bar soon! How will you celebrate Idaho Potato Lovers Month? didn't find anything new to request this week. I clearly fell behind in posting the winners on a couple of giveaways, so here they are! The winner of the Progresso Recipe Starters prize pack was "Realia". An e-mail has been sent to the winner. The winner of the Little Caesars Gift Card was Carly. An e-amil has been sent to the winner. Thanks to everyone for entering and watch for more giveaways coming soon! There are still 5 more days to enter to win a Giant Cookie Cake - more details here. I am a big fan of cookies. A well made chocolate chip cookie to me delivers the right balance of sweet and salty, gooey and crunch. As a child I really enjoyed it when one of my friends would bring in a giant decorated cookie for their birthday treat at school. There was just something so tantalizing about the taste of the Chocolate Chip Cookie combined with the frosting. At Cookie Gift Baskets, they offer not only Chocolate Chip Cookies (approx 12"), but also Sugar Cookies (approx 9"). You can add your own custom message on many of their offerings to. Know someone that you want to send a cookie to? Right now, they are offering free shipping on their Cookie Cakes. If you win, will you send it to yourself or send it to surprise a friend or family member? Use the handy dandy rafflecopter widget below to enter the contest. Remember that you must put a comment on this post to complete the mandatory entry, but then lots of other entry options will become available once you've completed that task. Don't forget that we review all entries to make sure that they have been completed and are not duplicates. In those instances, your entry will be removed or disqualified. All entries beyond the mandatory comment entry are optional. REMINDER - When we select a winner, we WILL review your entry to make sure that you've completed the given entry task. If you did not complete the task, your entry will be disqualified from winning the prize. Giveaway sweepstakes is open to U.S. residents in the continental states (e.g. lower 48) and only to those 18 or older! Winners will be chosen randomly. Three winners will receive their design choice of a Giant Cookie Cake valued at up to $35. 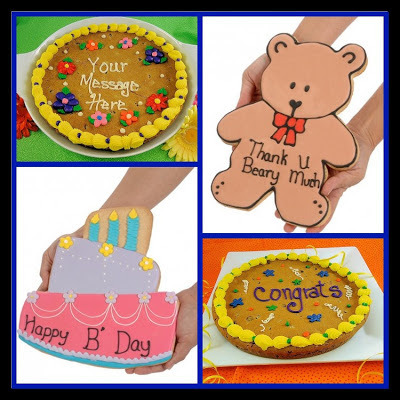 The designs can be seen on the cookie cakes page. Winners will be notified via e-mail so make sure you provide the correct address. Winners must respond within three days of being contacted. If you do not respond within that period, another replacement winner will be chosen. Giveaway ends at midnight EST on February 24, 2013. The sweepstakes winners will be announced by March 3, 2013." No compensation was received for this post. I am a participating blog and get to be part of the entry form for participating. Looking for a tasty way to celebrate Valentine's Day with the whole family? 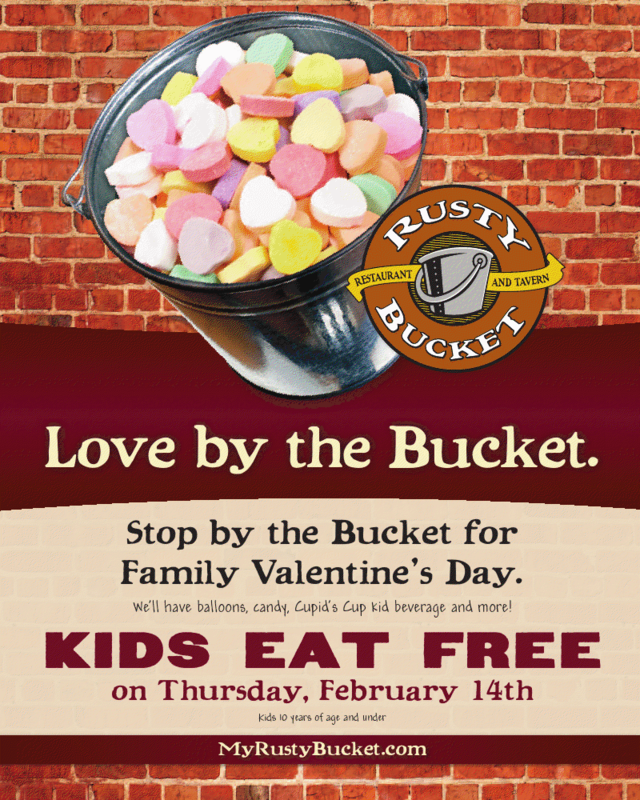 Why not head over to your local Rusty Bucket and share a meal tonight - the kids eat free. Plus, they will have balloons, candy, Cupid's Cup kid beverages and more! I have never been to the Rusty Bucket, but after checking out their menu, I am excited to give them a try. The Rusty Bucket features an extensive American menu of your family favorites. There’s something for everyone!" Find the Rusty Bucket location nearest you here. No compensation was received for this post. The information about the special was provided by the Rusty Bucket. Congratulations to Carmen! 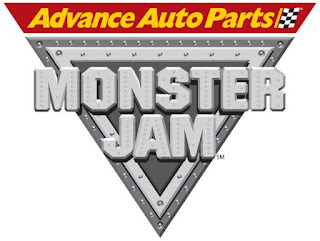 Their entry was selected as the winner of the Family 4-pk of tickets to see Monster Jam in Cleveland. Not the winner? You can still take advantage of the special offers to get your tickets to the show. MONSTER JAM FAMILY FOOD PACKAGE ***BEST VALUE! Not valid on FR or Gold Circle tickets. Can buy any number of tickets, not just in 4 packs. Not valid on Front Row or Gold Circle Seats. $10 KIDS tickets to all performances! Tickets are $3 more day of the show. I actually made two trips to CVS last week. It was bit of a crazy week, but when I had the opportunity to get free (except tax) deodorant and fish oil, it made sense to fit it in. I would have gotten them both on one trip, but the store I stoppped at first did not carry the Nature Made Full Strength Minis Fish Oil. Total $.12 plus $.99 tax OOP. I love pancakes. I could eat them for Breakfast, Lunch or Dinner - and have. There is just something that is so satisfying about a warm stack of pancakes with that touch of warm maple syrup. If you like pancakes, and live near an IHOP, today is your lucky day - today you can score free pancakes (consider making a donation though). You can learn more about National Pancake Day and find a location near you, on IHOP's website. Of course, there are restrictions - like limit of one short stack per customer, dine in only and while supplies last to name a few...so, as always, I recommend confirming with your local restaurant before heading out. When it comes to pizza, the dough really can make or break a pizza. My husband is such a big fan of the dough, that there are actually times where he will order a pizza with double dough. I have to say that I have heard of double cheese and double meat, but double dough really caught me off guard the first time that I heard him order it. Speaking of dough, have you seen the newest campaign from Little Caesars? I must admit that I rather enjoy their quirky commercials. When it comes to quality, Little Caesars is serious! Seriously, we make fresh dough every day in each store! 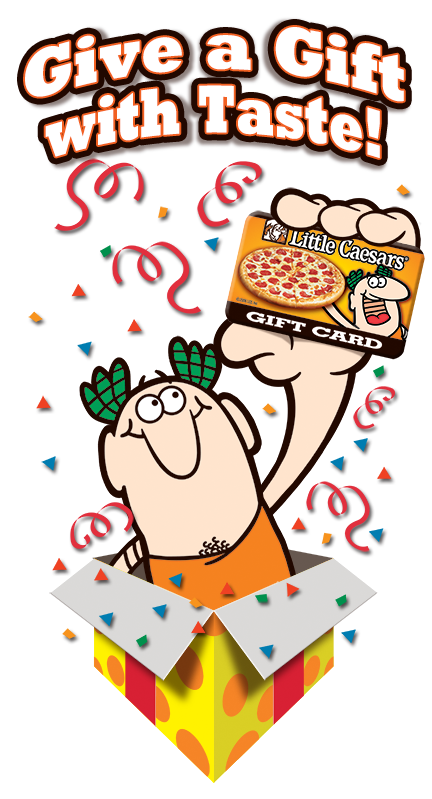 If you are ready to give it a try, you can find your local Little Caesars location here! Courtesy of Little Caesars, one A Busy Mom of Two reader will win a $10 Gift Card. Giveaway will remain open through February 18th. Giveaway is open to residents of the US only. One winner will be selected through Rafflecopter. The winner will have 48 hours to respond or a new winner will be selected. The big game is coming tomorrow. It's funny, I don't really remember watching the Super Bowl as a child. In college, it was a great excuse to get together with a group of friends and visit. After graduation, I continued to join friends for the game - we would visit, eat and watch the commercials. When we were first married, my husband and I even hosted a few Super Bowl Parties. The two things I remember about those parties are the food and the contest that one of his friends would do each year - in the form of a poll with questions about the coin toss result, the category of the first commercial after kick off, who would score the first field goal, who would punt first. It made it fun and kept everyone engaged in the game. When we moved to Ohio, we started to go to parties instead of hosting them. It is still fun for me, because I get to create fun dishes to share and visit with others. To me, I guess you could say it is more of a social and food experience than a game. How are you planning to celebrate this Sunday? 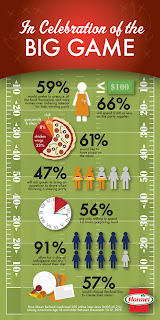 Hormel Foods recently conducted a survey about different Big Game traditions and recipes. The survey found that 57% of people, if given the choice, would want to have Rachael Ray plan their party menu. Do you have a favorite chef or celebrity that you would want to cater your party? Personally, I am torn. I have several favorite celebrity chefs. Alton Brown appeals to the scientist in me with the explanations that he provides. I also really like Rachel Ray. Her 30 minute meals are a favorite with me. 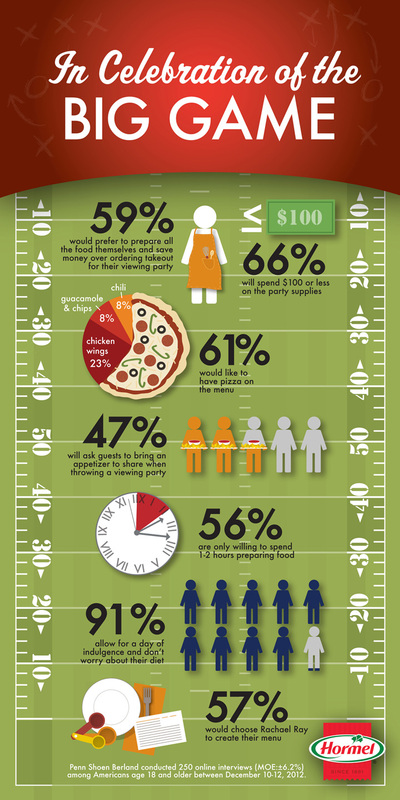 Did you know that 61% of those surveyed said that pizza is a top pick for their game day menu? I am a fan of the classics, but I also like to bring new ideas to the table when we celebrate. One of my favorite new ideas from last year is Buffalo Chicken Rolls - they are easy to prepare, super tasty and a lot neater to eat than a stack of wings. With this year's game in New Orleans, maybe it is time to try out a Cajun style meal. Maybe swap out the chili for some Easy Cajun Jambalaya - a quick recipe to spice things up in classic New Orleans style. How will you celebrate the big game? Do watch the game or just the commercials? What is your favorite game-time food?